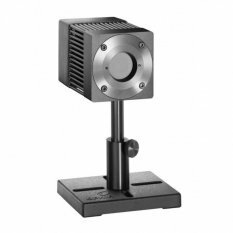 The F150A-BB-26 is a general purpose fan cooled thermal power/energy laser measurement sensor with a 26mm aperture. It can measure power from 50mW to 150W and energy from 20mJ to 100J. It has the spectrally flat broadband coating and covers the spectral range from 0.19 to 20µm. The sensor comes with a standard 1.5 meter cable for connecting to a meter or PC interface. A mounting bracket is needed to connect most thermal sensors to a fiber adapter (SC, ST, FC or SMA). This bracket can be used for thermal sensors with an 18mm diameter.